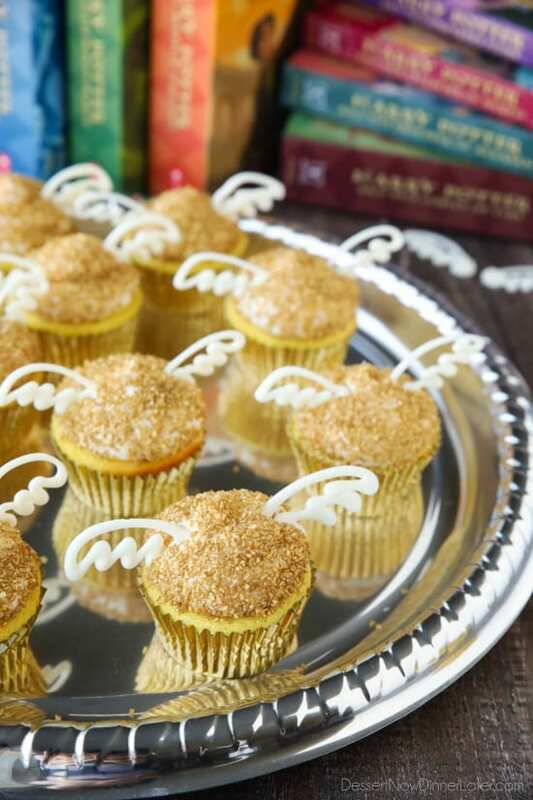 Harry Potter Golden Snitch Cupcakes - Dessert Now, Dinner Later! 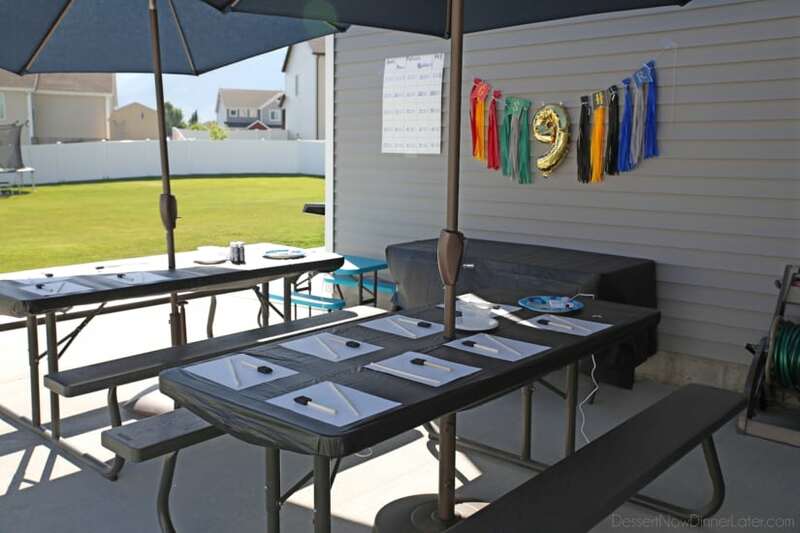 This month, we had a Harry Potter Birthday Party for my oldest and it was so much fun! It was his golden birthday. 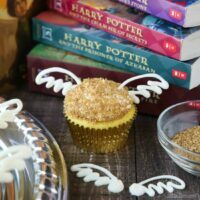 He turned 9 on the 9th of June and so I thought it would be fun to have Golden Snitch Cupcakes as well! 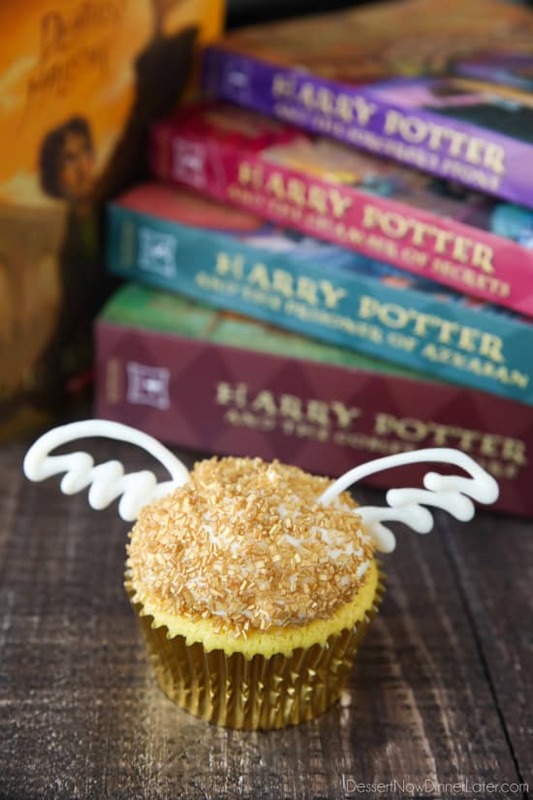 I saw a bunch of ideas for golden snitch cupcakes using Ferrero Rocher chocolates or other chocolate truffles to top the cupcake with, but I wanted something different, and super simple, yet nice. I decided to use gold cupcake liners, gold sprinkles, and candy melts for the wings. Super easy! My son wanted a lemon cupcake with cream cheese frosting. (RECIPE BELOW.) I think the yellow of the lemon cupcake looked nice with the gold. 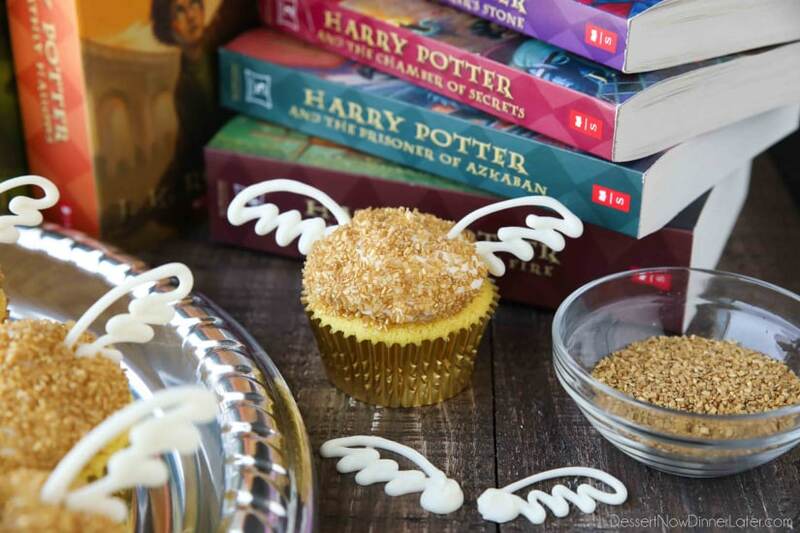 You could also use yellow or vanilla cake mix for the golden snitch cupcakes. 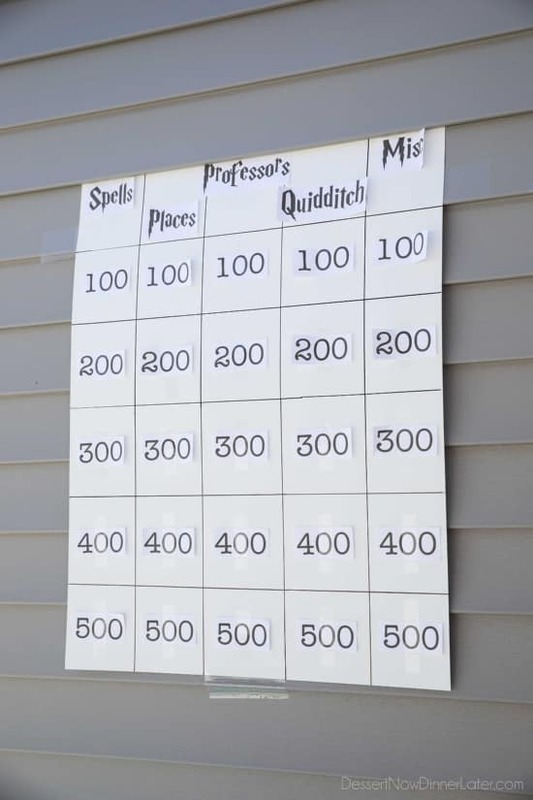 This was our first “friends” party, so I went all out. 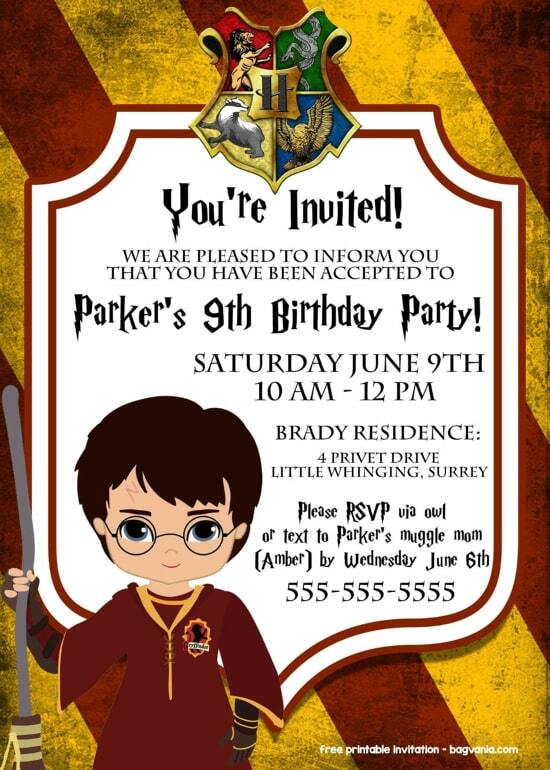 I found this adorable FREE printable Harry Potter Party Invitation from Bagvania. All I had to do was download some FREE Harry Potter fonts and type in our information. 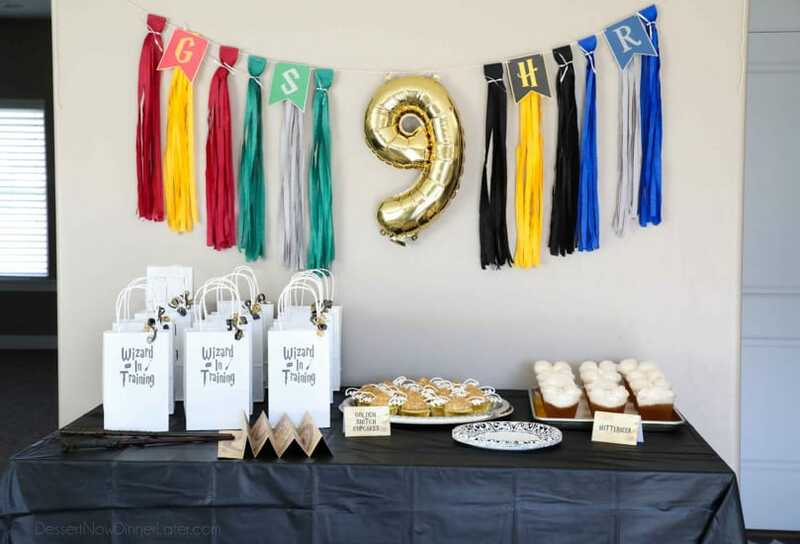 For the decorations, I printed these FREE Harry Potter House Banners from Paper Trail Design. And bought correlating streamers to make DIY Tassels using this tutorial from Party Majors. I got the number balloon from good old Walmart. It came with a straw to inflate it and had holes to hang it up. I looped everything on some white string/twine. The FREE printable food labels are from Just Sweet and Simple and I used the FREE Harry P font. 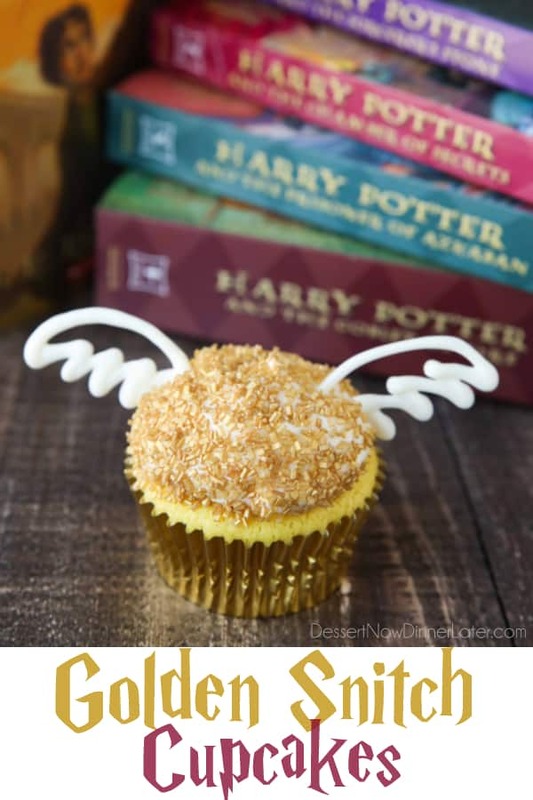 I made golden snitch cupcakes from scratch (RECIPE BELOW), Butterbeer (from Cooking Classy), and some pretty great gift bags! There was a LOT of printing and cutting involved, so make sure you have lots of ink, paper, card stock, and a paper trimmer. Also, glue and or tape. – A Spell Book. I used cheap plastic photo books, black card stock for the outside covers, and got the FREE printable spell pages from Lemon Squeezy Home. 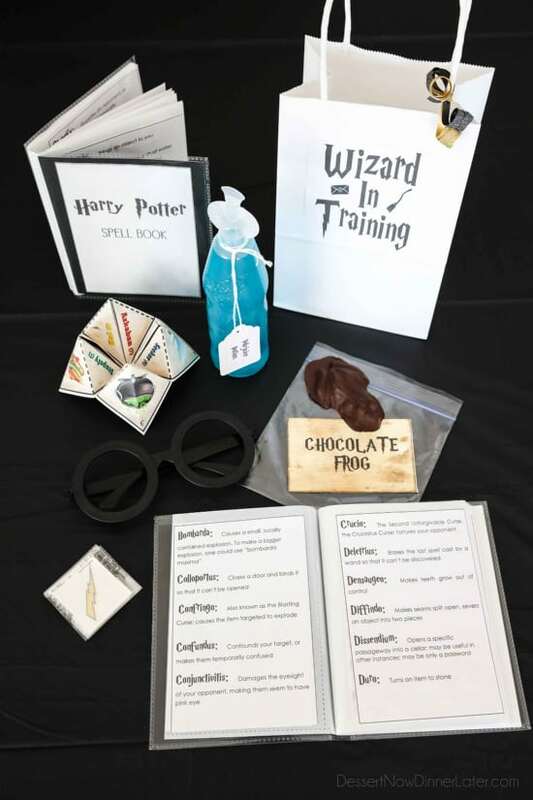 – Chocolate Frog – Get the Chocolate Frog candy mold on Amazon. I melted two bags of Guittard semi-sweet chocolate chips for 16 frogs and it was plenty. Be sure to tap the mold to get the air bubbles out! – Harry Potter Glasses – Get the Harry Potter Glasses on Amazon. Every kid LOVED these! – Lightning Bolt Tattoos – Get the Lightning Bolt Tattoos on Amazon. Since there were 72 tattoos, I grouped them in packs of six (for 12 kids), and stapled them together. There’s quite the variety! 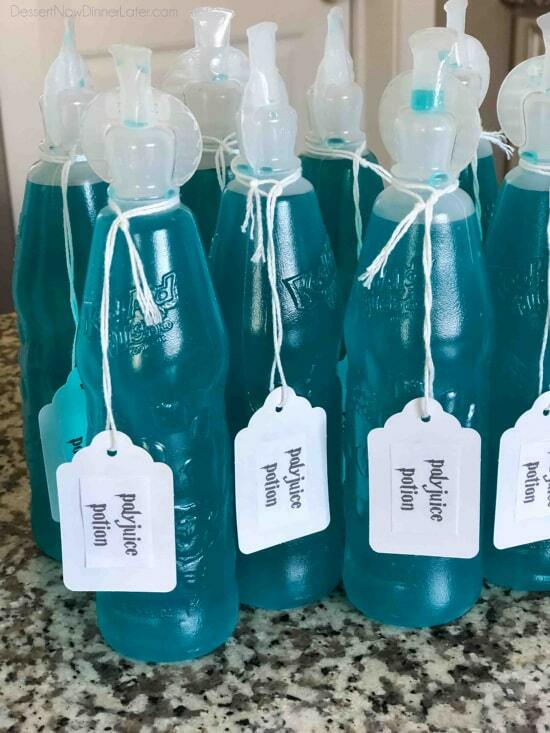 – Polyjuice Potion – I used Kool-Aid Bursts (squeeze it) drinks, bought string tags from Dollar Tree, and used the FREE Harry P font to type the name for the tags. 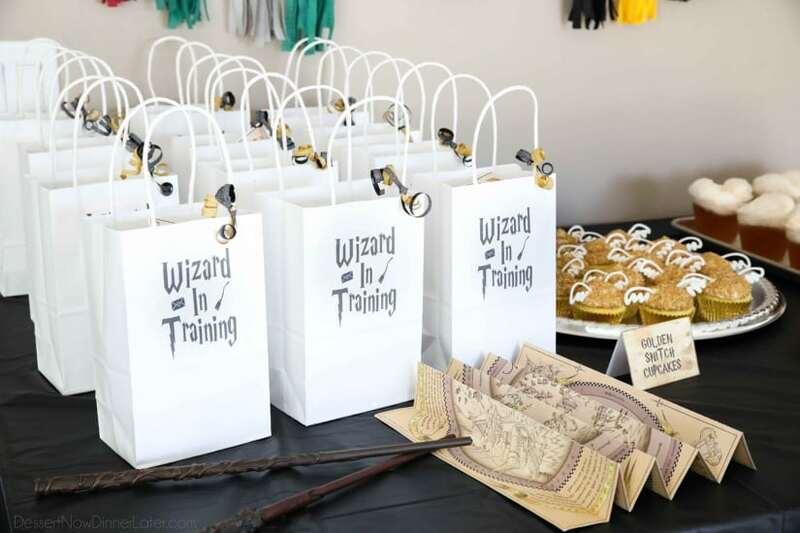 For the party, we made DIY Wands from Boxy Colonial. It was simple enough with 8-9 year old kids. Just some chopsticks, hot glue, paint, and sealant. The kids LOVED it! After the wand making and trivia game, we ate pizza, butterbeer, and my golden snitch cupcakes. It was a blast! Then the kids got their gift bags and were casting spells on each other. It was a great party! Immediately sprinkle the gold sprinkles over the frosting and on the sides until covered. Shake off any excess sprinkles. For the wings, I melted white candy melts according to the package directions, put it in a plastic bag, sealed it shut, cut off the corner, then piped wings onto some wax paper on a cookie sheet. Pipe a nice round button (to support the wing in the frosting), then the bottom feathers (about 4 points), and a half circle for the top of the wing. I found it easier to do the right side of the wings, flip my cookie sheet and pipe the left side upside-down, because it was a little awkward to pipe to my left. Do what is most comfortable for you. 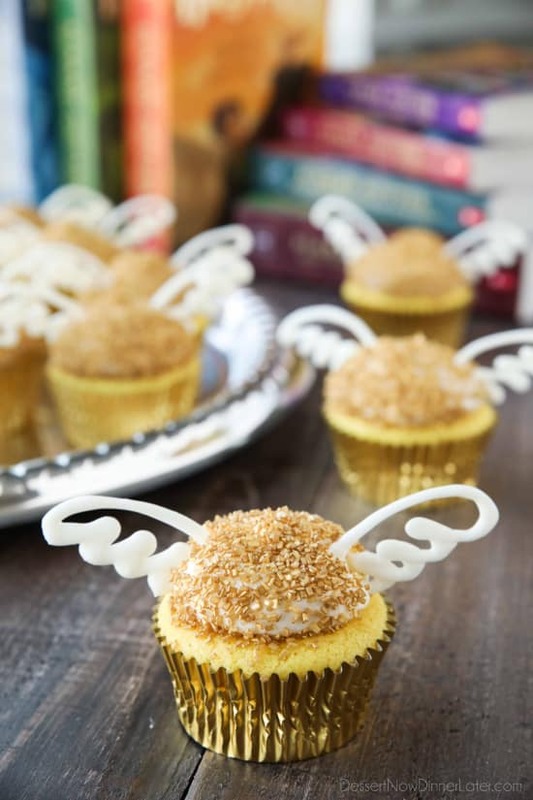 You can see what my piped wings look like outside of the cupcake in the image above. So easy! The flavors I used are in the recipe below. Feel free to use your favorite yellow or vanilla cake and buttercream recipe if you want. 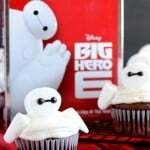 In a large bowl whisk together the flour, baking powder, and salt. Set aside. In the bowl of a stand mixer, cream the butter and sugar together with the paddle attachment. Add the eggs one at a time. Mix thoroughly after each addition. Add the lemon zest, lemon juice, and a few drops of yellow food coloring, if desired. Combine. Alternate adding the flour mixture and buttermilk, beginning and ending with the flour mixture. Do not over mix! Line muffin tins with 30 gold cupcake liners. Fill cups 2/3 full with batter. Bake at 400 degrees Fahrenheit for 13-15 minutes or until baked all the way through. Let cupcakes rest in pan for 10 minutes before transferring to a wire rack to cool completely. Place the cream cheese in a mixing bowl. Using a hand mixer, beat until smooth. Gradually add the butter 2 Tablespoons at a time, and continue beating until smooth and well blended. Melt the white candy melts according to the package directions. Pour into a zip-top plastic bag and seal shut. Cut off the corner, then pipe wings onto a wax paper lined cookie sheet. Place gold sprinkles in a large bowl. Fill a piping bag with an open coupler and the cream cheese frosting. Immediately sprinkle the gold sprinkles over the frosting and on the sides until covered. Shake off any excess sprinkles. Repeat with each cupcake. 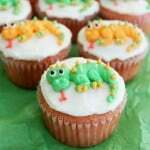 Place a left and right wing into the frosting of each cupcake. Serve to guests and enjoy! 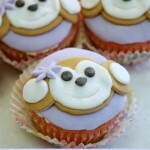 To Store: Gently cover cupcakes with plastic wrap and refrigerate, if desired. 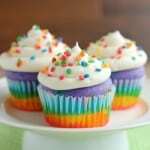 Let cupcakes come to room temperature before serving.